Etiology=multifactorial, occurs during adolescent growth spurt. Rate of osteonecrosis is nearly 0% following treatment of a stable slip, estimates of the rate after an unstable slip range from 10% to 60%. Dull, aching, chonic or intermittent hip, groin, thigh or knee pain. Pain may be increased with activity. May present with main complaint of knee pain (Kocher MJ, JPO 1999:19:455). Labs: CBC, ESR, CRP consider to eval for infection in DDX. ultrasound classification-stable=metaphyseal remodeling, no effusion. Unstable=effusion, no metaphyseal remodeling. Modified Dunn procedure (Ziebarth K; Clin Orthop Relat Res. 2009;467(3):704): surgical dislocation, preserves blood supply and allows reduction of epiphysis. 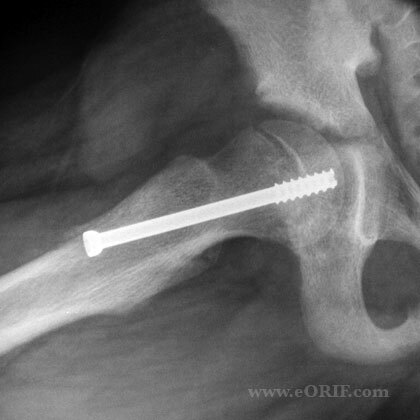 15% broken implants; 26% osteonecrosis; mean slip angle= 6° at follow up (Sankar WN, JBJS 2013;95A:585). 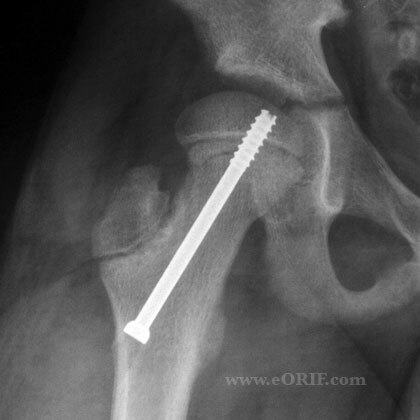 Severe SCFE with limitated ROM: proximal femoral osteotomy with stabilization in situ/introchanteric osteotomy with IF. (Diab M, CORR 2004;427:204). Draws lines on skin in both planes along proper screw insertion planes to determine skin incision. Keep in mind the greater the slip, the more anterior your starting point will be. Want screw perpendicular to physis in both planes. Avoid multiple entrance holes as this increases risk of fracture. Increasing number of screws used has been correlated with increasing number of complications. Advance screw until 4-5 threads are across the physis. Chondrolysis=narrowing of the joint space to at least one-half of that in the contralateral hip in unilateral casea and >3mm in bilateral cases. 5-7%. Increased risk with permanent pin penetration. usually partial weight bearing for 6wks. Risk of Bilateral SCFE can be assessed by determining bone age. 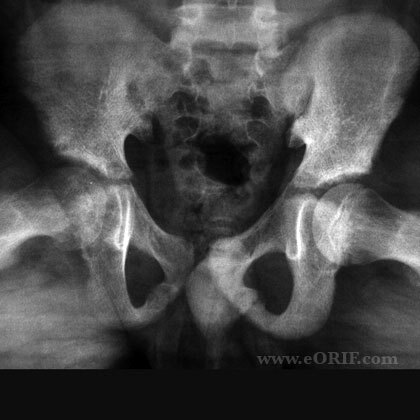 Lower bone age is correleated with increased risk of bilateral SCFE (Loder RT, JPO 2006;26:300).